This provides a guide on how to use the Piraso client application. Piraso Client is a NetBeans Platform application that allows user to monitor Piraso enabled web application. To get the most out of its capabilities and features, you should be familiar with its concepts. Concepts describe the basic notions of the tool. 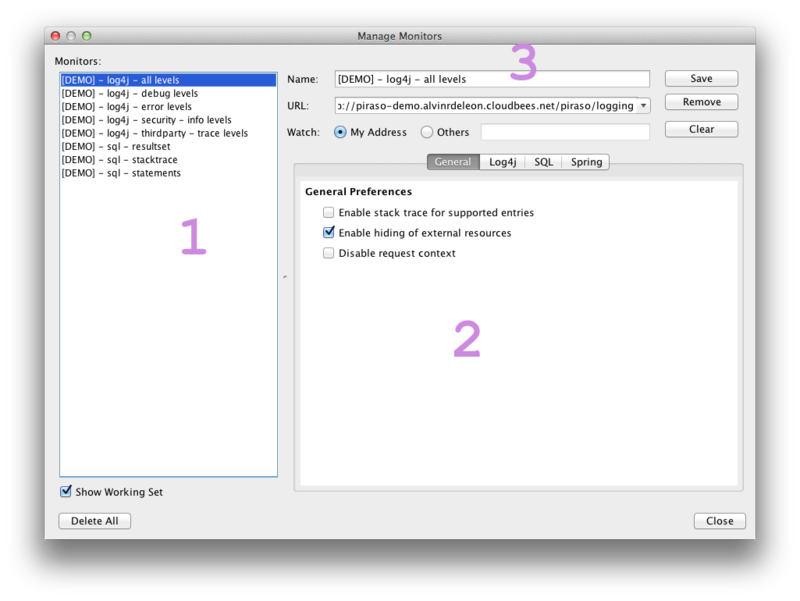 A monitor contains context logging monitoring preferences. When created this will open in the Monitor Window and lets you start monitoring. This determines the information we want to monitor in the Piraso enabled application. 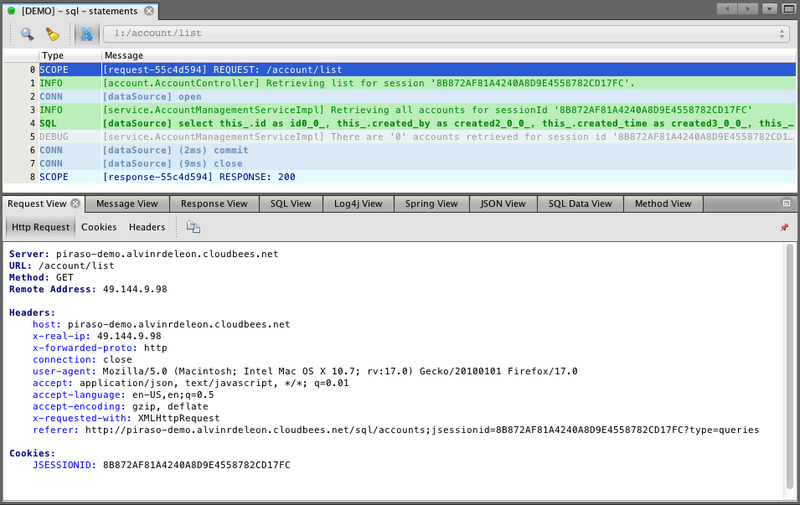 Example are SQL and log4j context loggers, which let you monitor SQL executions and log4j log entries respectively. Profiles are set of monitors. When created this will open all associated monitors in the Monitor Window. This is a monitor entry. An entry corresponds to one row in the Monitor Window. This determines the entries scope in a monitor. Monitor entries are usually group per request. Below shows the Piraso client application workspace. To reset the windows to the original arrangement just click on Window > Reset Windows menu. Click this to create new Profile or Monitor instances. Click this button to open a saved Monitor request entries. Click this button to save the currently selected Monitor instance. Click this button to reconnect the disconnected Monitor instance. A monitor with icon on the tab means that the Monitor instance is connected. Click this button to disconnect the Monitor instance. A monitor with icon on the tab means that the Monitor instance is disconnected. Click this button to manage Monitors. Click this button to manage Profiles. The window is tab-based. When you create a new monitor instance, it opens in its own tab. This displays the monitor entries in a table captured from the piraso enabled application. Click this button to clear the current monitor request entries. Click this button to initiate a new search. This toggles the display of the search pane. If this check box is selected, Piraso client will distinguish between upper and lowercase letters while searching..
if this check box is selected, Piraso client will search for whole words only, that is, for character strings separated with spaces, tabs, punctuation, or special characters. If this check box is selected, the search string will be perceived as a regular expression. Click this button to toggle the auto-scrolling of received from the monitored application. When the auto-scroll is active you won't be able to switch requests. You need to explicitly disable to be jump from one request to the other. Displays all Monitor instance and all its requests on tree view. Click this button to collapse the request tree view. Click this button to toggle showing of colored nodes for recent requests. Requests received within 10 secs. Requests received older than 10 secs but below 30 secs. Requests received older than 30 secs. Select a monitor and click on this button to target the monitor node on the request tree view. This window allows you to manage Monitors. In here you configure the application to be monitored given the url and the context logger preferences. This list all the monitors created. 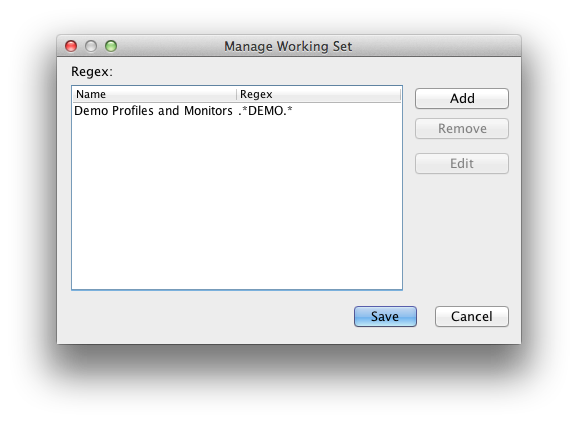 When the Show Working Set checkbox is selected only the Monitors associated to the Working Set will be shown. Deselecting the checkbox will show all created Monitors. You can edit a monitor, by selecting the monitor from the list, do an update and click on Save. You can remove a monitor, by selecting the monitor from the list, and click on Remove. 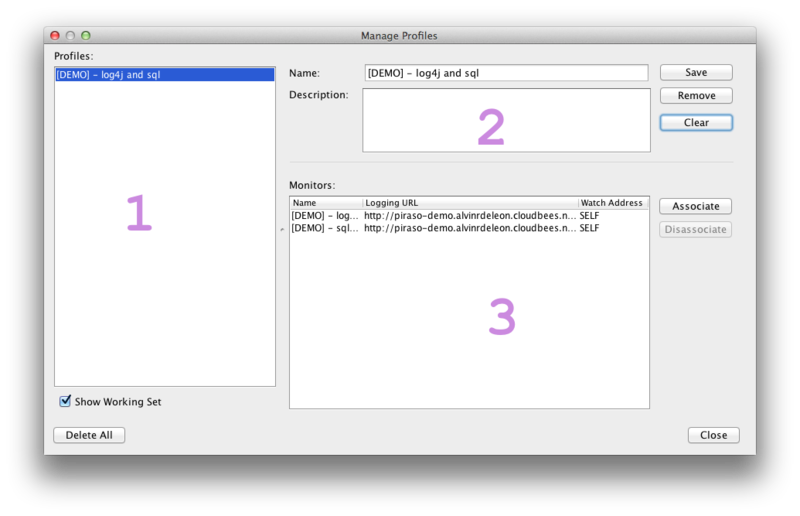 These are context logger preferences for the selected monitor. This is the preference you customize to configure the amount of information you want to receive during your monitoring. Unique identifier for your monitor. This is the piraso enabled application logging URL. Determines whether you want to watch your own traffic or watch others by providing their IP address. These are your general monitoring preferences. Select this if you want your request entries to support stack trace. Please do note that only those entries that support it will show the stack trace. 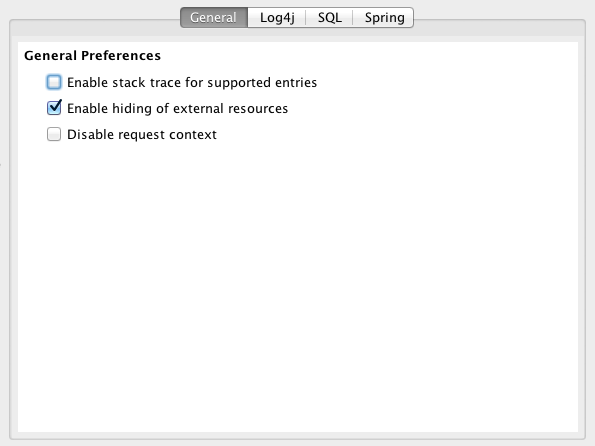 Deselect this if you want that every request should be track including request for external or static resources. Select this if you don't want the Monitor instance to separate per request. This will display request entries in a single table. 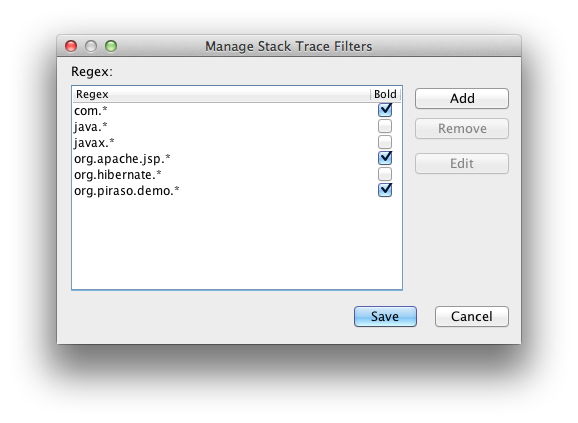 Go to Tools > Manage Stack Trace Filter to manage your stack trace filter. This enables you to only filter the pattern specified from this window. Stack trace filter will help you easily see the application class flows. 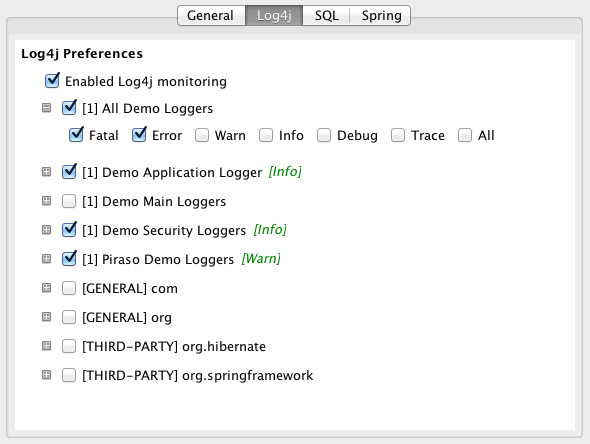 This determines the log4j context logger monitor preferences. In here you can select which logger log entries and their corresponding log levels should appear for monitoring. 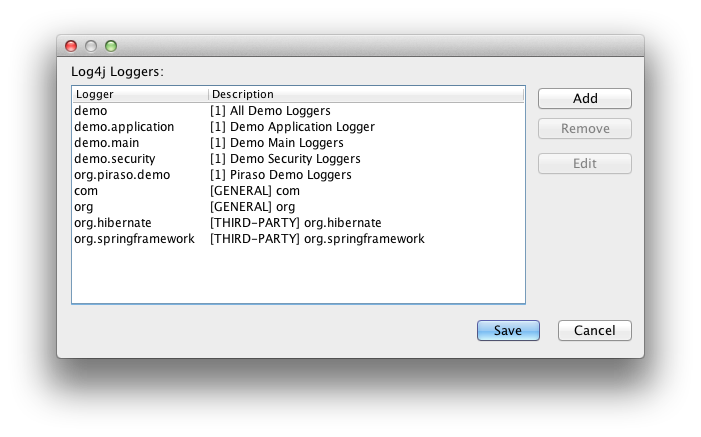 Go to Tools > Log4j Loggers to open the Log4j Logger dialog and manage your loggers. Logger's are sorted by description ascending. All log4j entries supports stack trace. This determines the SQL context logger monitor preferences. Select if you want to monitor SQL Connection log entries. 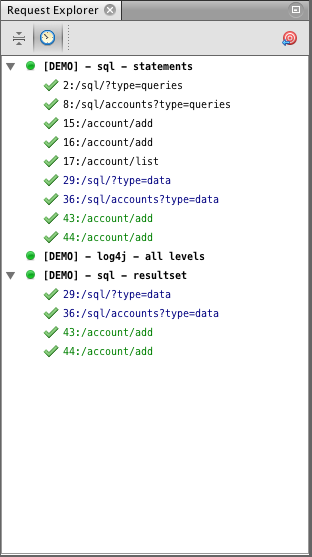 Select if you want to monitor SQL Prepared Statement log entries. Select if you want to monitor SQL Result Set log entries. 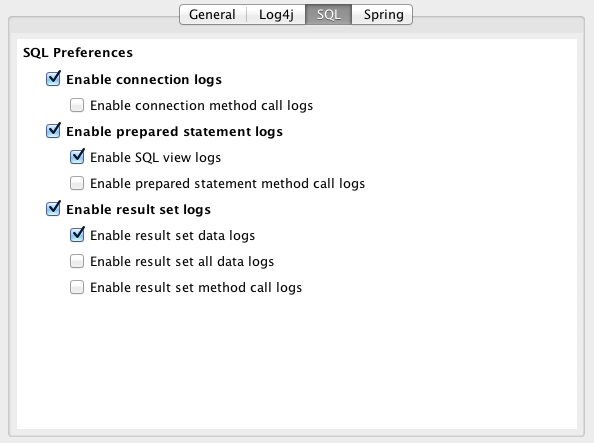 Only the method call logs supports stack trace. For SQL result set, only up to 100 records will be retrieved unless the SQL result set all data logs is selected. 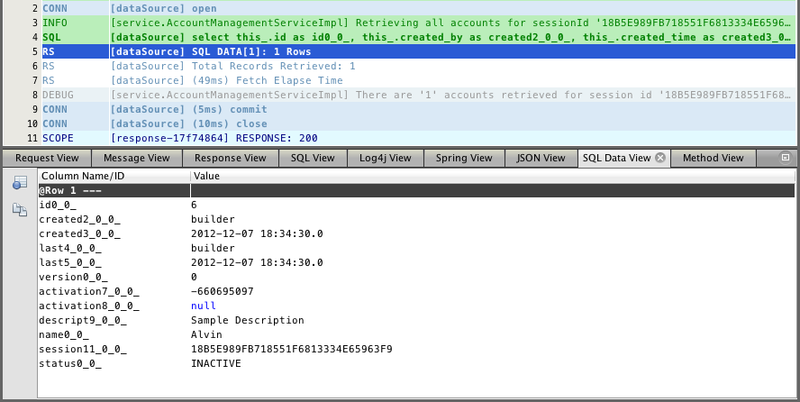 Be careful in enabling the SQL result set method logs, this may cause to much log entries. Enable only when the need arises. 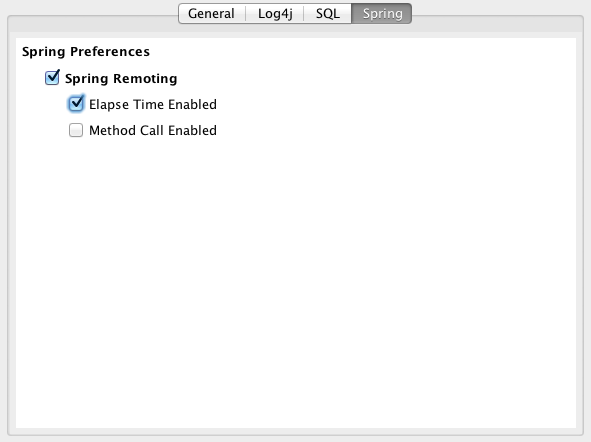 This determines the Spring context logger monitor preferences. Right now only Spring Remoting is supported. This is needed when you want to cascade the monitor context from one server to the other when doing a remote call. This list all the profiles created. When the Show Working Set checkbox is selected only the profiles associated to the Working Set will be shown. Deselecting the checkbox will show all created Profiles. You can edit a profile, by selecting the profile from the list, do an update and click on Save. You can remove a profile, by selecting the profile from the list, and click on Remove. Unique identifier for your profile. This is a table showing all associated monitors. An Entry View is a window that provides a detail information of a particular request entry. This is a generic view that displays a simple message entry. This displays the entry http request information. This displays all the Http Request cookies. This displays all the Http Request headers. This displays all the Http Request parameters. Click on a log4j entry from the Monitor Window to show this view. Click this button to show the exception. This will only show when the selected log4j entry has an associated exception. When stack trace logging is enabled this button shows the log4j entry stack trace. Click this button to show the table of the set query parameters. Click this button filter the stack trace from the Exception and Stack trace view. When a log4j entry has a XML message then this view will be available. This will pretify the XML message as displayed below. When a log4j entry has a URL message then this view will be available. This will pretify the URL as displayed below. 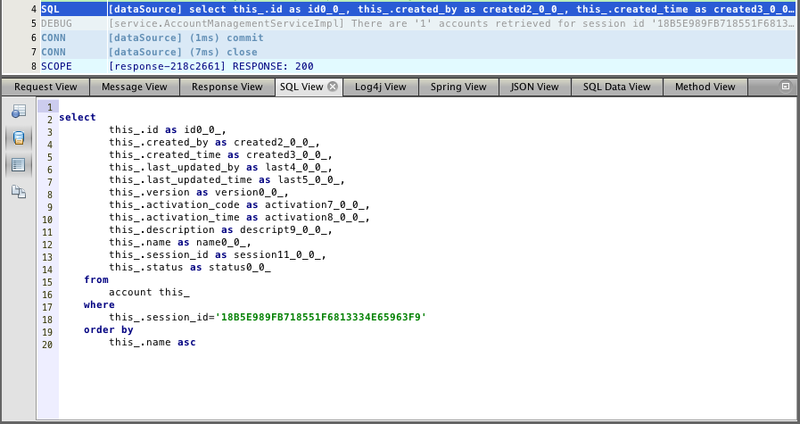 When a SQL Prepared Statement entry is selected, this view will activate and shows the SQL statement. Click this button to replace all sql parameters into literal values. Click this button to format the SQL statement. Click this button to copy the SQL statement. When a SQL Result Set entry is selected, this view will activate and shows the retrieved records from the database. Click this button to show the table column meta data definitions. Click this button to copy the records as CSV. Some usability preference features available for user experience. This allows user to select what columns to display on the Monitor Window. 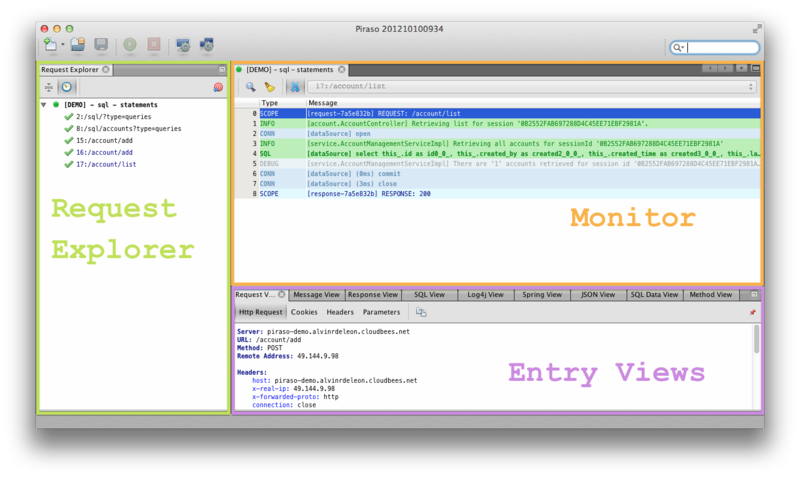 This can be accessed from View > Monitor Instance View menu. This allows user to change to font size. This can be accessed from View > Font menu. This allows user to manage Working Set. With working set users group Monitors and Profiles. This can be accessed from Tools > Manage Working Set menu.